Pruning agroforestry areas generates significant amounts of lignocellulosic biomass every year. The energy production potential of this biomass is unclear. The aim of this research was to quantify the amount of pruning residues generated from Teak (Tectona grandis), which are composed by mixtures of wood and leaves. An equation from a regression model has been proposed to quantify these residues with a adjusted coefficient of determination (r2) of 0.73. On the other hand, mixtures with different wood/leaf ratios of Teak were characterized by its higher heating value (HHV), elemental composition, structural and proximate analysis. This analysis allowed for further development of indirect HHV prediction models that are economically attractive and less time consuming than direct measurements. These models presented high coefficients of determination (r2 0.66–0.77). It has been determined that teak has the highest mean HHV of 17,373.7 kJ kg−1 dry. Elemental analysis showed the highest carbon content was about 46.2%. Mean hydrogen content was 7.5%. Leaf content has influenced on ash and nitrogen percentages. Nevertheless, the amount of nitrogen did not reach 1% for mixtures with leaf ratio lower than 50%. 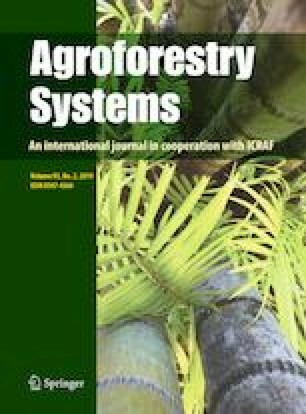 It is concluded that the proposed model can be used to predict the biomass of teak pruning grown in Aw climatic conditions. From the characterization of these pruned materials, the energy, residues and emissions can be estimated. This work has been funded by Universidad Católica Santiago de Guayaquil through a research program coordinated by the Sistema de Investigación y Desarrollo (SINDE). BV-M conceived, designed the experiments and wrote the paper; JJPA performed the experiments and analyzed the data.